Pioneer DJ expands its family of Serato DJ Software controllers with the DDJ-SZ, its flagship model that strongly emulates the look and feel of Pioneer’s world-renowned CDJ digital players. The DDJ-SZ is designed for the serious “controller” DJs who are inspired by the performance specifications of Pioneer’s professional DJ products but also want the convenience of an all-in-one system. 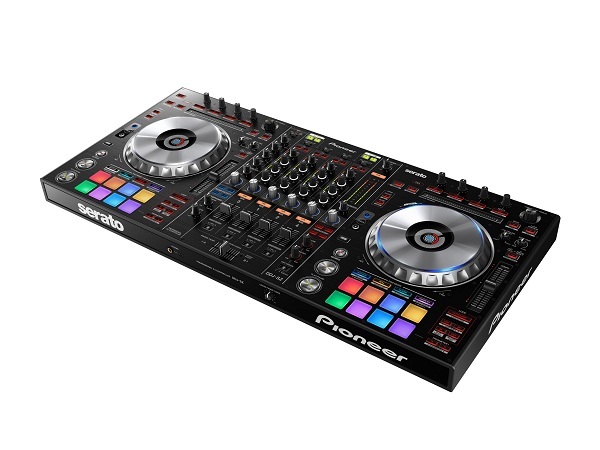 The new controller is 35 percent bigger than the widely popular DDJ-SX, sporting additional functionalities and features including extra large JOG wheels (the same size available on CDJ players), large performance pads with multi-color illumination, DJM style mixer, dual USB ports, and a MAGVEL cross fader. Directly below each JOG wheel are four effects buttons – HOT CUE, ROLL, SLICER, and SAMPLER. Under the effects buttons are eight extra large “performance pads” that DJs can quickly access to insert different modified effects to music playing. In Sampler mode, the output volume of the sampler effects also varies depending on the strength of user’s tap of the pad. An update from the current DDJ-S controllers, the performance pads on the DDJ-SZ illuminate in different colors to quickly communicate the effect mode it is in. The mixing area of the DDJ-SZ also closely mimics Pioneer’s DJM series of professional mixers, utilizing a generous number of controls and effects with features including Sound Color FX and new Oscillator functions to deliver more creative music arrangements. The mixer can also be used as a standalone 4-channel mixer for outboard players and turntables. •	Serato DJ Software – Bundled with the DDJ-SZ for an easy out-of-the-box experience. •	Slip Mode – While activated, Slip Mode silently continues song playback during a performance loop, scratch or hot cue and resumes audible playback when the loop, scratch, or hot cue operation is ended, creating smoother and more seamless transitions. •	Needle Search – Users can immediately jump to a specific part of a music track with a simple touch of the Needle Search pad. •	High Quality Audio – A low-jitter clock and high-performance digital-to-analog converter (DAC) are used for accurate audio playback. In addition to a 24-bit digital signal processor to minimize digital noise, its balanced hybrid operational amplifier and balance output circuit also reduce analog circuit noise. •	P-LOCK Fader Cap – Prevents the fader knob from slipping off during extreme use. •	Auto Standby – Automatically switches to standby mode when no activity or input is detected for a period of time.